Yesterday, we completed testing on Channel A of our radio interferometer telescope, nicknamed Project Odin. This telescope is basically a direct conversion receiver (at 20 MHz), with a highly selective RF front-end. The front-end gave us quite a struggle to get it working, but alas, we can listen to decametric emission now! Unfortunately, the Sun has been pretty quiet the last few days, so we don't have much data yet. I'll be sure to post anything we observe today. I think we've got a pretty good location staked out for testing today, and hopefully we can get some Solar noise! Nice thing is the typical Ohio weather (clouds) won't affect observation. 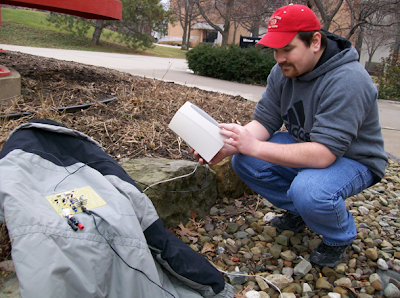 Pictured below is the receiver and me testing it. PCB board with channel A complete. Me listening to the sounds of space. A sample of typical data from the telescope is shown below. We're not totally sure what this example came from, but it most likely is of Solar origin. We didn't get the telescope set up until dusk, and the Sun has been mostly quiet recently so this is mostly what we got for data. 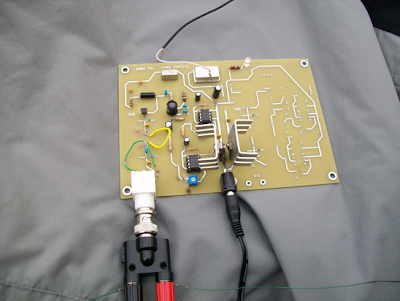 We did, however, show that the radio signal level decreased as the Sun set, so the amplifier is indeed working. Haha, now all we have to do is solder together Channel B just like Channel A and we'll have an interferometer! Nhiều du khách có nhu cầumua đồ cũ tại nhật bản để tiết kiệm được nhiều chi phí mua sắm lời chúc ngày 8 3 hay ý nghĩa dành cho người mẹ, người cô, người chị. Bên cạnh đó những lời chúc ngày 8 tháng 3 hài hước luôn là điều thú vị dành cho nhiều chị em phụ nữ. Tuy nhiên, những món quà tặng luôn quan trọng. Vậy 8-3 tặng quà gì cho người yêu và tin nhắn 8/3 hay cho người yêu. nks for your post! it contains quite a lot of things to learn! it's great that I known this site! Good Amounts - Some customers can get stores saved into their record immediately. While elements, for example, salary cutoff points and record might be thought about, numerous shoppers find that they can get enough money to cover their crisis costs. Thank you for sharing the news.